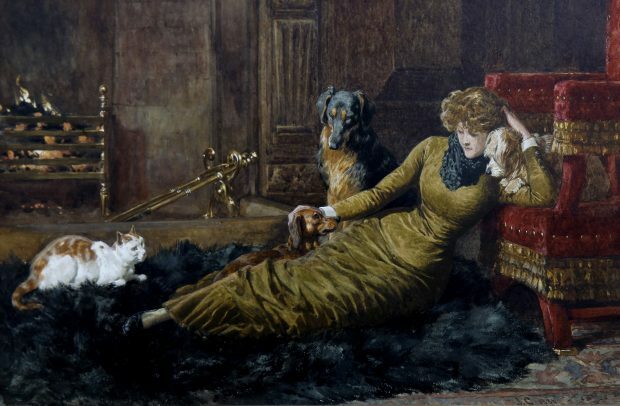 Her Favourites by John Charlton, 1881. 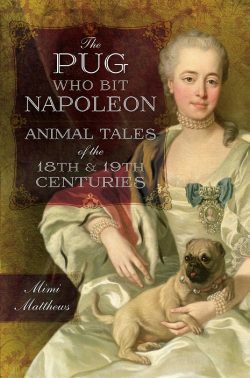 The nineteenth century news is filled with reports of hero pets rescuing their masters and mistresses from various catastrophes. Dogs routed burglars and saved children from drowning, while cats meowed the alarm when the house was on fire or when a family member had stopped breathing in their bed. 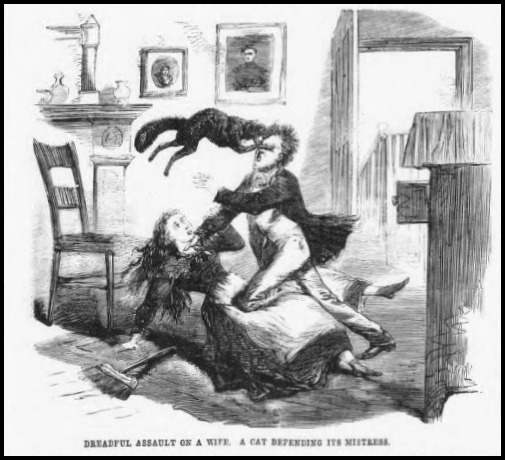 Both cats and dogs were also known to intervene in cases of spousal abuse. For a battered Victorian wife, this animal intervention could sometimes mean the difference between life and death. In July of 1867, a man named George Amey was brought before the Marlborough Police Court in London on the charge of brutally assaulting his estranged wife, Isabella. George had long since moved out of the home he shared with his wife and was currently cohabiting with another woman. Isabella, meanwhile, remained in the family home in Tottenham Street with only her cat, Topsy, for companionship. George was arrested, charged, and ultimately sentenced to prison for one month. Dreadful Assault of a Wife. A Cat Defending Its Mistress. Charles Sutton was sentenced to six weeks imprisonment, ordered to pay a fine of £20, and advised to exhibit good conduct for the next six months. 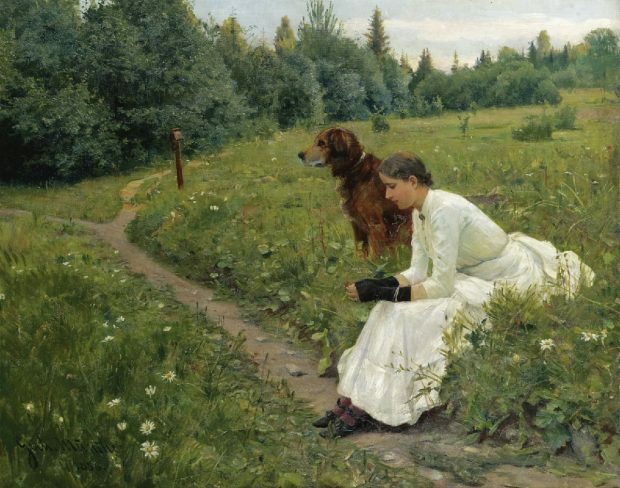 Idyll by Gerhard Munthe, 1886. In a much more severe case from 1892, a deranged husband attempted to murder his wife with a knife. The 3 December 1892 edition of the Lisburn Herald and Antrim and Down Advertiser reports the case of a wealthy farmer named Laurence Archer who had been married for over twenty years to his wife, a respectable woman of fifty with whom he had 12 or 13 children. Mr. Archer was a jealous man, prone to erratic behaviour., who had always been suspicious of his wife, even though there was never any reason to doubt her good character. The next morning, an empty fishing boat was found floating in the river and, on the opposite bank, there were footprints in the mud. All signs pointed to Mr. Archer having successfully made his escape. Whether he ever returned to his wife and thirteen children, I do not know, but I like to think that, if he ever did show his face again, the police—and the bull terrier—were waiting for him. 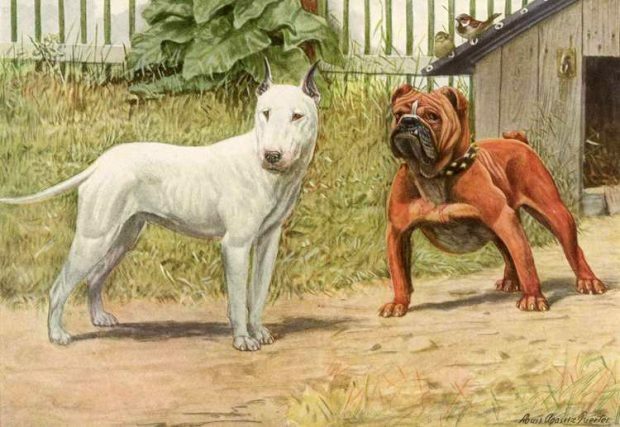 Bull Terrier and English Bulldog by Louis Agassiz Fuertes, 1919. Illustrated Police News (London, News), 6 July 1867. © British Library Board. Lisburn Herald, and Antrim and Down Advertiser (Antrim, Northern Ireland), 3 December 1892. © British Library Board. Shields Daily Gazette (Tyne and Wear, England), 10 March 1887. © British Library Board. Animals are just wonderful- their love & devotion truly knows no bounds! That bond between an animal and its owner is beautiful and protective. Beautiful blog page. I don’t believe I’ve seen your new digs until now. Thanks, Angelyn :) I’m so glad you found your way over to my new website! Wonderful stories! Yay for the faithful, loving dogs and cats that protected women who had so little power back then. Thank you for sharing those! You’re very welcome, Ellen :) I’m glad you enjoyed them! You’re very welcome, Vickie :) I agree completely about pets being a member of the family. They take their roles very seriously, too! My own cats and dogs watch over me all the time and are FAR more than just “pets”. They are my family and watch over me at all times….just as I watch over them. I’m old now with no one but a rather “sour” husband to protect me and also have severe Rheumatoid Arthritis. My beloved cat and dog children MAKE life worth living and give me the LOVE I’ve never had from any human. Thank you for writing this article. You’re very welcome, Laura :) I feel the exact same way about my pets!